Camping can be a great bonding experience for your family, and is sure to generate memories you will never forget. The comfort and durability of your tent, however, can make or break your entire trip. But, with a little information in your back pocket, you can find a tent to suit your family�s needs and make camping the joy it was intended to be. Sure, the manufacturer says this tent is made for four people. But what size are these people? If everyone stands at around 4�5�, you might do all right, provided you only brought one set of clothing and a water bottle each. More likely, however, you�ll need to look at the manufacturer�s recommendations and double it, especially if you�re housing adults and/or teens. When trying to come up with the perfect size, calculate approximately 32 square feet per adult (you can go smaller for kids under 12, typically). This gives enough room for each person to sleep comfortably with a modest amount of camping gear. But also take into consideration the tent�s height and actual width. People 6� tall or taller are going to need at least a 7� clearance lying or standing. If you have more than four people, or just like the idea of more privacy, consider getting two tents � one for adults, and one for the kids (those who are old enough to sleep on their own and know to stay put when they�re awake and the adults are still snoozing). Smaller kids can be quite comfortable in a smaller tent, while saving the bigger one for the bigger people. This also has the advantage of not having to try to find a flat area large enough to pitch an enormous tent. Tents come in many styles, but most are versions of three main types: A- frame or �pup� tents, dome, or cabin-style. A-frame tents are the standard �tent� shape and can be large enough to fit a family, but tend to limit standing room due to their shape. Dome tents, being the most aerodynamic of the three, are great for weathering storms and high winds and have better standing room than an A-frame, but compromise on floor space. Add in a few more feet when selecting a dome tent for multiple people and supplies. The cabin-style tent is ideal for accommodating several campers since they have square or rectangular floors and straight walls, creating maximum headspace. However, where they excel in roominess, they fail in their ability to stand up to harsh weather like heavy snowfall or high winds. Still, if you watch the weather and know you�ll be camping through some relatively quiet nights, this style tent works best when trying to cram the most people under one vinyl roof. Every family is on a budget, and this of course must be taken into consideration when shopping for camping accommodations. Like with most things in life, you really do get what you pay for, especially when paying for a piece of cloth and some tent poles that will be all that stand between you and the elements while sleeping in the great outdoors. 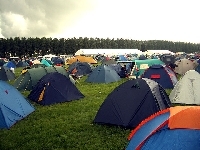 Pricier tents are typically made of sturdier materials, have better weather proofing, and boast cooler features (like sectioned off rooms or better ventilation). If you think you are going to run into inclement weather at all, it may be worth it to drop the extra bucks to get a better product. This is doubly true if you plan on doing a lot of camping and don�t want to replace a torn tent with bad zippers every other camping trip. However, if you plan to only camp in nice weather, close to town, maybe once a summer, the cheaper options might suit your needs just fine. But be realistic with your expectations. A cheap tent is not one that is built to last, nor to protect you from much but maybe an uncomfortable breeze and some light mist. Look at all the features and how they fit in with your plans before making a final decision. In the long run, an �expensive� tent that lasts your family five years of hard use is a much better investment than a cheaper tent you have to replace five times.